The BEAM! Team continue to work away, and we are grateful to each and everyone of our volunteers who offer their time and support, be it at sessions, providing hospitality or in the background managing admin, finances, paperwork, fundraising, media and websites. The BEAM! Team were absolutely delighted to receive a nomination (as it turned out three nominations) for ‘Community Team Award’ at the CDC Community Awards. 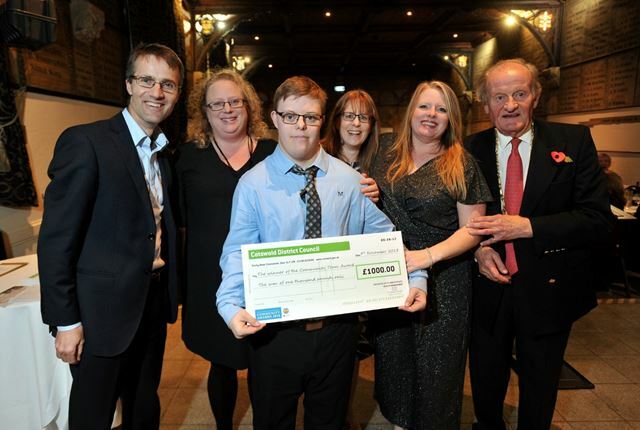 We were even more delighted to find out BEAM won the award and were presented with a cheque for £1,000. The BEAM Team extend a huge thank you to everyone involved, including our gymnasts, parents, carers, volunteers and funders that made this possible. 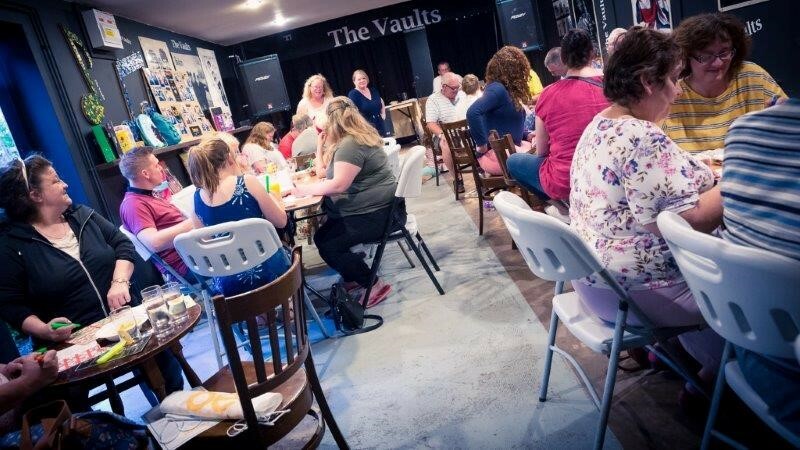 The prize money is being used for the benefit of the Club and its members, including offering subsidised seats at the local pantomime for our gymnasts and their families, and a volunteers social evening. Our BEAM! Team Coaches have been attending training and courses. Active Gloucestershire facilitated several days of inclusive training workshops attended by Adele, Rachel and Claire. This included an autism awareness and challenging behaviour. They explored ways in which our organisation can make our session inclusive for all. It was also a chance for us to meet and exchange ideas with other groups and also chat to parents with children who have disabilities. Adele and Rachel also attended The Inclusion Mark training so that BEAM can be recognised for their inclusivity. We are awaiting a visit from CDC to view our session and credit us with the mark. In March some of our volunteers will be attending a workshop on how to coach disabled people in sport. 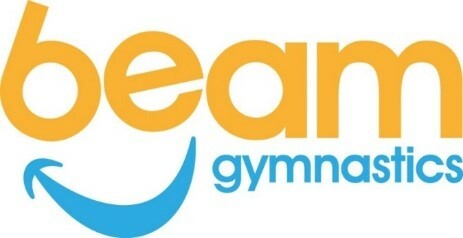 If any parents hear of any courses that would be of interest to our BEAM Team please let us know. Sessions are working well at the moment and are fitting the needs of the children. Cirencester College provides us with brilliant storage and facilities however, the setting up of the equipment is problematic. Please bear with us whilst we continue to work with the college. We have also experienced some unexpected availability dates, and we endeavour to let you know of these as soon as we are made aware. 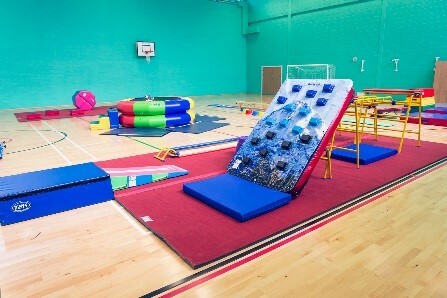 Due to exams, there is a period in June when we will be unable to use the Sports Hall at the College, however we are exploring alternative venues for these sessions. Fairford Primary school is being extended and they are doing their best to enable us to run our sessions. We thank you for your continued patience and support as the building work continues. We say a fond farewell to Zac, one of our original Fairford BEAM members. Zac has joined Rachel’s after school club alongside his peers. He will be missed at BEAM! and we wish him well! Once again, BEAM! will be taking part in the Fairford Festival on June 8th and 9th. All of our gymnasts are welcome to join us in the Space themed parade on the Saturday. 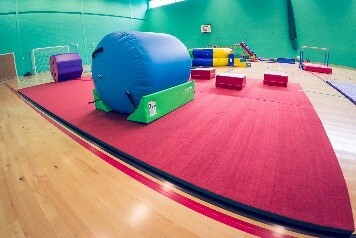 We will also be running Gymnastics Taster sessions on the Saturday afternoon. At the Sunday fete BEAM! will be there with our Sensory Tent. We hope to see you there! Once again, a huge thank you from Rachel, Adele and myself to each and every person and organisation that supports BEAM! Gymnastics and helps make it the gymnastics club it is today. As BEAM! Gymnastics are about to celebrate their 1st Birthday, this is an ideal opportunity to take time to reflect on the journey of our first year. Run wholly by volunteers, the Not For Profit Organisation, BEAM! Gymnastics provides a safe and accepting environment where disabilities and challenging behaviours are not a barrier to experiencing gymnastics. BEAM! Team volunteers accept, understand and embrace that every session will be different and have enjoyed watching our gymnasts develop and gain confidence in physical activities and social interaction. 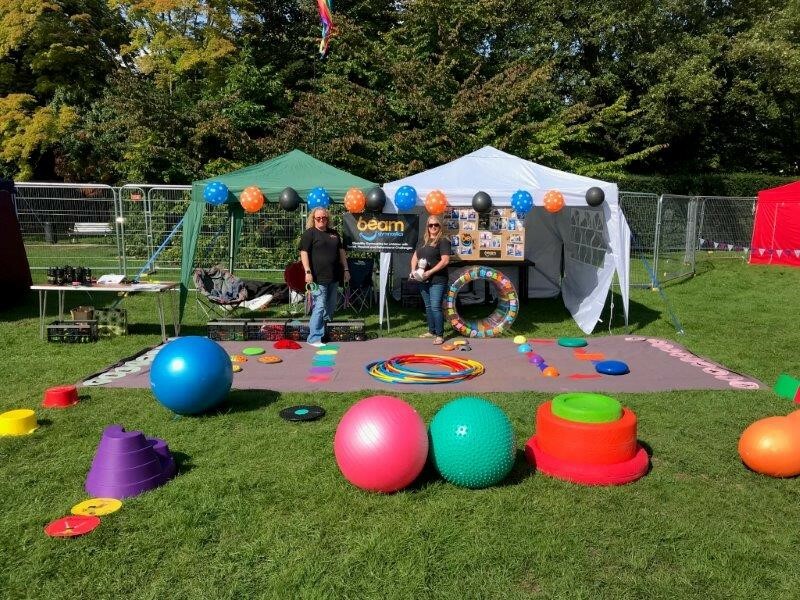 It all started in September 2017 with a 6 week pilot, supported by funding from The Barnwood Trust for equipment and Gloucestershire Disability Fund and an Anonymous donor supporting start up costs. Eight gymnasts attended the sessions held at Fairford Primary School. During the pilot sessions, BEAM! 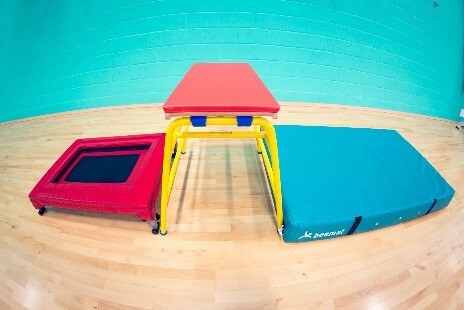 started receiving inquiries from people interested in registering their child for gymnastics sessions. A second term followed, with the eight pilot gymnasts returning and new gymnasts were enrolled to the existing group. 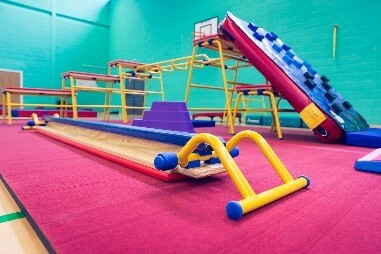 As the number of inquiries and registrations of interest increased, it quickly became apparent that there was a local demand for an accessible gymnastics club for children with additional needs. BEAM! Gymnastics looked for another venue to run an additional session, and from January 2018 ran two sessions a week, one at Fairford and a new session from Kingshill School in Cirencester. This is some of the unsolicited feedback that received from Parents and Carers since the launch of BEAM! Thank you to BEAM! Team for the wonderful and upbeat support, it’s definitely the club that was needed in Cirencester. We are very happy to be part of your new venture and always mentioning it to people about BEAM! O has been coming to BEAM! from the start and has absolutely loved it. His confidence has grown and his balance is finally coming!! I think this is such a fantastic club for children with additional needs as well as the classes for children without those needs. AA just loves going to gymnastics, it’s the highlight of her week! Could not be prouder of Z and how far he has come since starting At BEAM! gymnastics, he has grown in confidence and resilience so much and enjoys every minute of it!! If it wasn’t for somewhere like BEAM! where Z can be himself and they understand his needs so well he would never of had the opportunity to do something he is really has grown to love!! I can not thank you all enough for what you do weekly for Z.. it’s truly amazing!!! 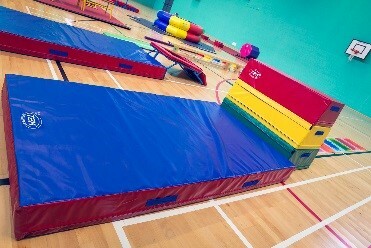 At the end of Term Six (Jun-Jul’18), the two sessions were regularly delivering gymnastics sessions to 19 children with additional challenges, with ten confirmed registrations on the waiting list, along with many general inquiries for places. The BEAM! Team comprised of twenty regular volunteers, supporting BEAM! in diverse roles including Coaching, Assistant Coaching, Admin and Finance, Website design, photography and Fundraising Support. In March 2018 BEAM! 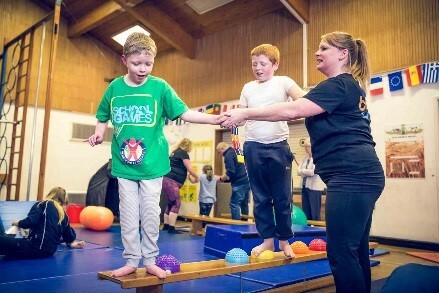 Gymnastics signed up to be a Special Olympics Hub Club. The Special Olympics mission is to ‘provide year-round sports training and athletic competition in a variety of Olympic-type sports for children and adults with intellectual disabilities. This gives them continuing opportunities to develop physical fitness, demonstrate courage, experience joy and participate in a sharing of gifts, skills and friendship with their families, other Special Olympics athletes and the community.’ As a Special Olympics Hub Club Active Gloucestershire will encourage other clubs to follow BEAM’s example. Adele and Rachel attended a course which will allow BEAM! to host Special Olympic events and be at the forefront of special gymnastics in Gloucestershire. The BEAM! Team aspire to have gymnasts at the Special Olympics one day. 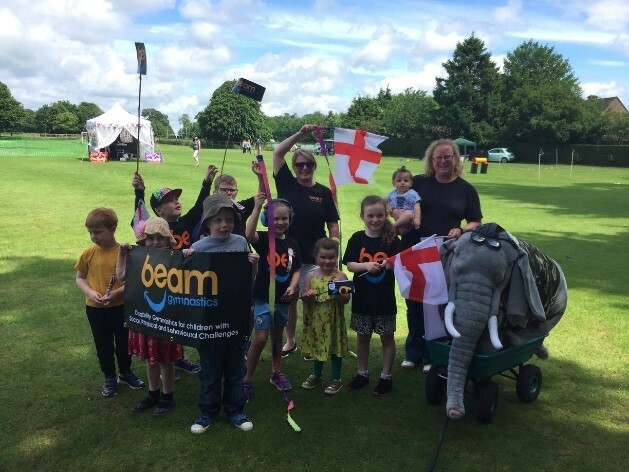 Fundraising and profile-raising activities have taken place throughout the year, all supported by the BEAM! Team volunteers. This has included BEAM! 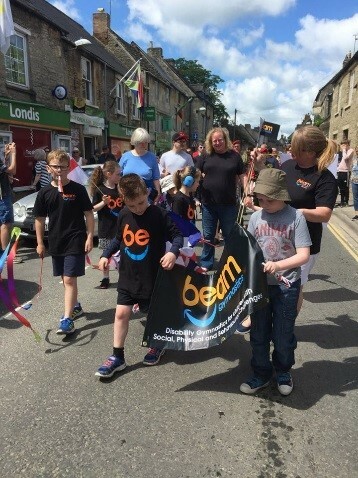 branded merchandise being made available for purchase, attendance at the Fairford Festival, including BEAM! Gymnasts taking part in the Carnival Parade, the Cirencester Mini Phoenix Festival and Cirencester Phoenix Festival. Our gymnasts took part in the Fairford Festival Parade, taking third place. Adele and Rachel, along with other BEAM! Team volunteers, used the events as an opportunity to talk to parents and carers about what BEAM! Gymnastics has to offer. This has resulted in new members and more volunteers. A fun, social fundraising evening of ‘BEAM! Bingo’ took place in July. One of the BEAM! 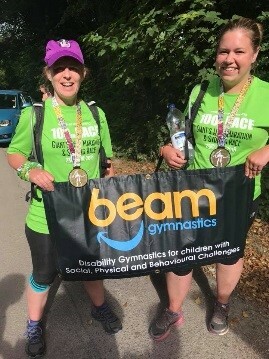 Team volunteers took part in their first marathon, using it as an opportunity to raise the profile of BEAM! and collecting ‘sponsorship’ via an Amazon Gift List wishlist of items that the BEAM! Team had identified as useful items that would be useful to the operation of BEAM! During July 2018, BEAM! Gymnastics were selected to be a beneficiary of the Waitrose Community Matters fund and also benefitted from a donation from Farmor’s School Non Uniform Day. Foresters Financial also supported BEAM! Gymnastics with a donation of kit boxes containing many items of small equipment and items. Behind the scenes, the BEAM! Team were considering the longer-term future for BEAM! and forged a relationship with Cirencester College. 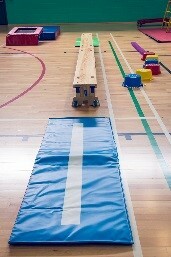 Here was a venue that offered excellent facilities, including parking, changing facilities, accessible toilets, a parent viewing area, support from College students through volunteering opportunities, storage, the opportunity to run additional sessions, a place where events could be run as well as an amazing Sports Hall, but there was no Gymnastics equipment. The BEAM! Team spent many months working on funding bids to support the purchase of equipment which would enable BEAM! Gymnastics to make Cirencester College their long term ‘home’. BEAM! 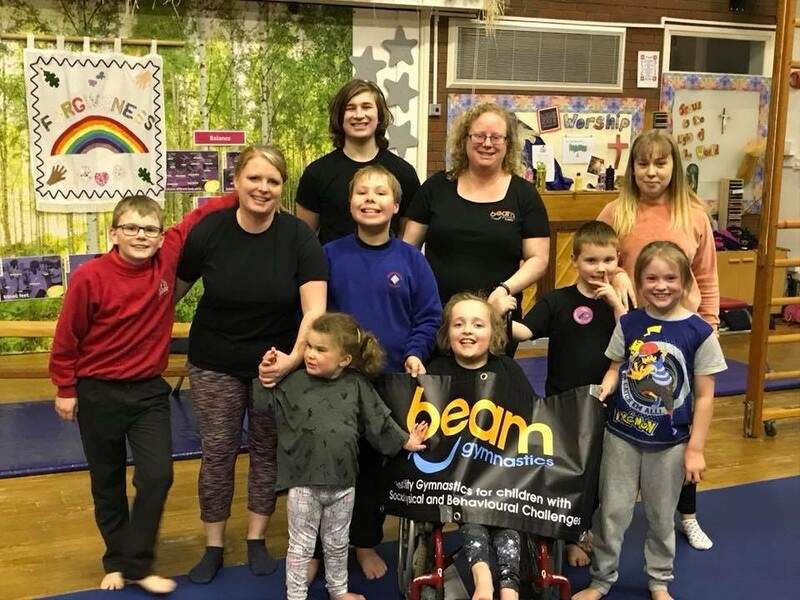 Gymnastics had successful funding bids with Active Gloucestershire, The Cotswold Primrose Trust, The Summerfield Charitable Trust and Magic Little Grant from Localgiving, in partnership with Postcode Community Trust, all awarding funding towards equipment costs enabling BEAM! to move from the Kingshill venue to Cirencester College from September 2018 and increasing session delivery from one to two sessions a week, whilst continuing to run a weekly session at Fairford Primary School. To be recognised and supported so soon in the BEAM! journey has confirmed the belief of the founding team that this type of club was very much needed. These grants have made it possible for our equipment to be tailored with special needs in mind. During August 2018 BEAM! held an Open Day at the new Cirencester College, putting out all of the equipment that had been funded throughout the year and inviting gymnasts past, present and future to come along and try it out. You will find Rachel at all of the BEAM! sessions. A former gymnast and qualified gymnastics coach, with many years’ experience, Rachel leads the sessions. She also works as a TA supporting a child with additional needs and is a local authority respite carer. Adele has many years’ experience working with children and adults with disabilities and additional needs. She helps lead the sessions alongside, Rachel. A full-time foster carer, Adele also works as a TA in a mainstream school supporting a child with emotional needs. Hazel looks after everything that needs doing behind the scenes! Although living in Northampton, she was born and grew up in Cirencester and regularly returns to the area. Hazel is responsible for seeking out and applying for funding, writing policies and procedures. AAT qualified, Hazel also looks after the finances. As well as this she deals with all communications with our members and the wider community. Claire helps out at our Tuesday sessions as a Coaching Assistant. A TA at a local school, Claire works 1:1 with an autistic child. Claire also helps out at our Tuesday sessions as a Coaching Assistant. Claire is chief executive of Citizens Advice, Swindon. Lauren is currently studying her A Levels at Balcarras School and supports our Tuesday session. Currently at Cirencester College Studying horsemanship. Ben has been brought up in a family that fosters, gaining a lot of experience with children with challenging behaviours. Ben supports all our sessions. Ollie helps at our Tuesday session and is a student in Swindon. As well as one of our coaches we hope that in the future he will represent the Club at a Special Olympics event. Charlie is Rachel’s son, is 11 years old and helps out at the Fairford session. He is usually in charge of the music. Helping out at our Fairford sessions, Francesca, with either her mum or support worker, quietly but competently supports all our BEAM! Gymnasts. Jess works at Cirencester College and has been instrumental in making the move to the new venue happen. A former gymnast, Jess volunteers at our sessions as much as she can. Achieving a BAGA Award…….to name but a few! BEAM! has also been able to provide a cuppa and a place to chat for parents and carers. It is expected that Cirencester College will be an even better place to provide this. Two social events have been successful – drinks at Torro Lounge and BEAM! Bingo at the Golden Farm pub. We look forward to some more! The BEAM! Team have tried to make our sessions as much fun as possible and trailed different set ups and equipment. Some have worked better than others! 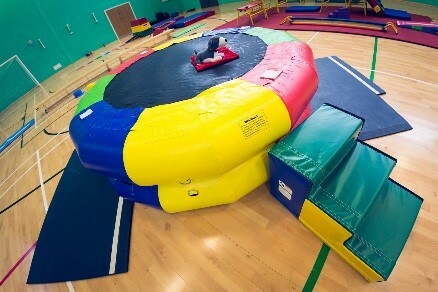 Who can forget the ‘Ball Launcher’ that our gymnasts got the hang of very quickly? The ball reached dangerous speeds much like the men’s serve at Wimbledon so had to be hidden!! Our expectations are limitless and the whole team are excited about the future of BEAM! Gymnastics. Our coaches will be attending specialist training during the coming months in different areas which will help support our gymnasts. We would like to thank everyone who has believed in our concept and supported us. It’s been a fantastic first year with many things to celebrate. We will continue to stick strongly to our ethos of small groups, personal goal settings and tailor-made sessions that are fun!